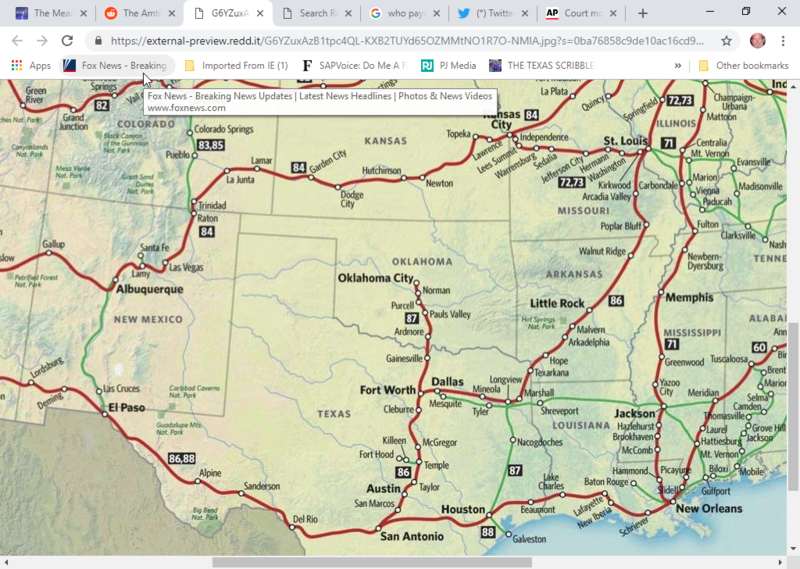 Barbara Ellen and I are studying this Amtrak route map to decide what to tell the travel agent about how we want to get to Trinidad, Colorado, in February. Objective: See snow. Romp in snow. Snap pictures of snow. Also get stoned. Looks like we get there fastest by going north to Oklahoma City, taking an Amtrak-provided Greyhound bus to Newton, Kansas, and thence by train to Trinidad. But the times must be calculated, since only one or two trains leave an Amtrak station daily. Probably only one from little 19,000 pop. Newton. UPDATE: We’ve bought tickets do it all: go north, west, south, and east. From Austin to Austin. Over seven days. With overnights in Trinidad, Albuquerque and El Paso. Most of the way in private sleeper compartments called “bedrooms” with an enclosed toilet, sink and shower. And a big picture window. Starting Feb. 9. Have to book early to get the compartments which are in high demand and low supply on any given train. More as we get closer. This entry was posted in Amtrak, Barbara Ellen and tagged Amtrak vacation. Bookmark the permalink. I would go the El Paso route, much more scenic. Snow? Brr… had more than enough for the rest of my life. We rarely get snow in Austin and then less than a quarter inch. So it will be a treat for us. We’ve decided to take the Texas Eagle to Fort Worth and then the Heartland Flyer to Oklahoma City. Then a bus ride to Newton, Kansas, and the Southwestern Chief to Trinidad. After two nights there, playing in the snow and eating cannabis candy, we’ll catch the Chief to Albuquerque, New Mexico, ride a bus to El Paso and come back east to San Antonio on the Sunset Limited. Then take the Eagle again home to Austin. That 300-foot high bridge over the Pecos River should be interesting. We might cross paths. I’ll be coming out of the mountains of Colorado around the end of October. West to Walsenburg, south to Trinidad, Raton Pass, East to Dalhart, then southeast to Austin. It’s because the snow you’re used to is the Celsius snow, we have Fahrenheit snow much different. We’re not going until February. You have to book sleepers months in advance they’re so popular. You must be driving. No passenger trains pass through Dalhart that I know of. Any candy brands in Colorado you recommend? As far as candy goes this is a barbarous state. Things in general are higher here (except maybe rent). I really don’t know that much about Trinidad except from driving through it. I was up at Ft. Carson almost 50 yrs ago, but never went down to Trinidad. I do highly recommend “Great Sand Dunes National Monument” and the restored “Bent’s Fort” if you guys can get around to seeing them.